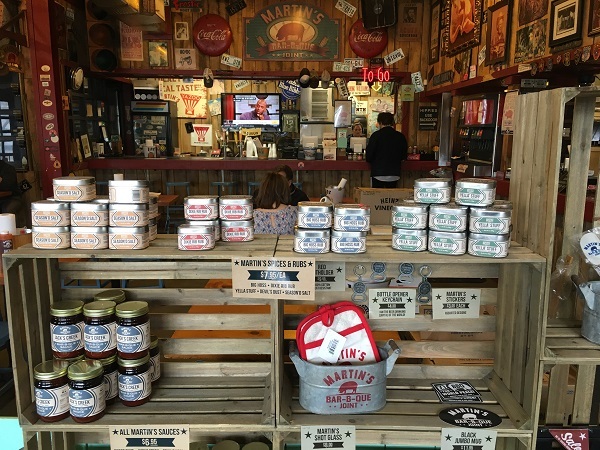 Martin’s Bar-B-Que Joint, Nolensville TN (take two) – Marie, Let's Eat! It’s been six and a half years since our previous visit to Martin’s. Time has been very kind to this great restaurant. On the Monday morning of our trip, we sat down to a small breakfast. The hotel in Memphis is attached to a Friday’s, and they have a buffet for guests. I just had a little plate of fruit, knowing that we had a pair of big barbecue meals ahead of us. Oh, all right, and one strip of bacon. The first of these meals was about an hour away in Brownsville, where we stopped for lunch at Helen’s, a much-loved and celebrated restaurant that we visited for the first time last year. We left Memphis at ten and got to Helen’s right after she opened the door. 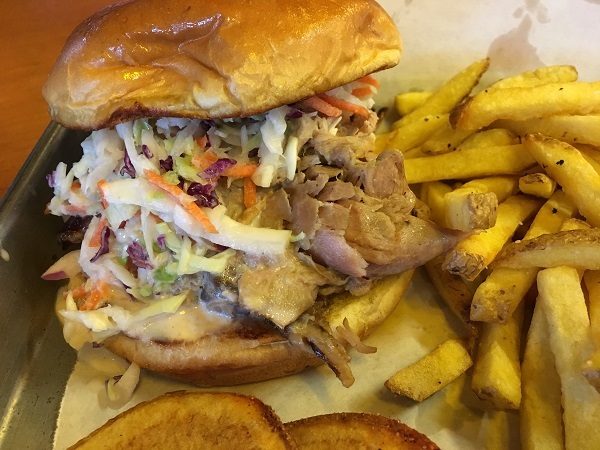 We absolutely loved our meal here, although I felt a pang of blogger guilt because this town is home to at least two other barbecue places, and I think I have a little responsibility to look into one of those the next time that we’re in west Tennessee. We did have one more small stop to make before leaving town. I like to get a little exercise after a meal, and while I won’t claim that we got very much of it, we did stretch our legs just a little bit walking back and forth along the path beside the Mindfield Cemetery, a sprawling work of public outsider art. This is something that everybody should see. When we do stop in town again for one of those other barbecue restaurants, we’re making another pilgrimage here. And a couple of hours later, we were in Nolensville. Wow, a lot has changed since our previous visit back in 2011. Our son was just five months old then, and he’s nearly seven years old today. The main road around the area was a state highway, TN-840, then. It’s an interstate now. And there was just the one restaurant. Now there are three more Martin’s in the greater Nashville area, and one up in northern Kentucky. The next Martin’s to open will be in Spring Hill, a little further west along the I-840 curve. *waves furiously at Pat Martin* Hey! We’re in Chattanooga! We badly need you over here! In our previous story about Martin’s, I see that I got one thing wrong. Just the one? It must have been a good day. I described Pat Martin’s devotion to smoking the whole hog as “eastern Carolinas” style. Wait, no, that’s two things. What I should have said, even in 2011, was “eastern North Carolina” style. But what I didn’t know then was that Martin’s love of whole hog was a western Tennessee thing. At least once upon a time it was. Rien Fertel’s 2016 book The One True Barbecue, which might be my favorite book on the subject, explained how there once was a much more thriving tradition, in backyards and restaurants, of cooking whole hogs in the west. It was written over the course of a couple of years of major change in the region, though. Siler’s Old Time BBQ in Henderson, one of the book’s most interesting major locations, changed to cooking shoulders, and one of the style’s greatest champions, Ricky Parker of Lexington’s Scott’s-Parker, passed away. Late last year, Daniel Vaughn brought the story more up to date with a great little article at Texas Monthly. It’s kind of a sad story. Twenty years ago, there were many, many more whole hog places in that side of the state than there are today. 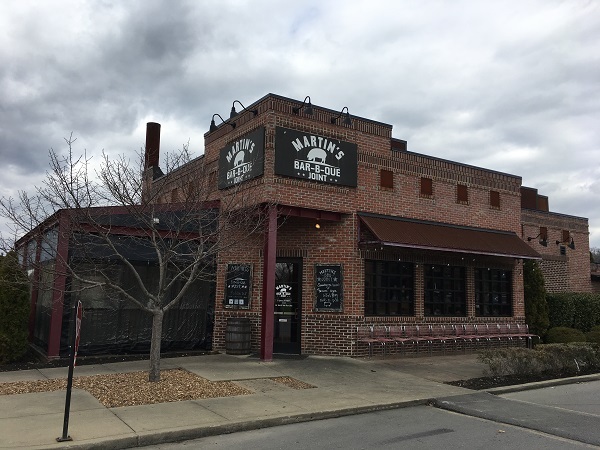 Between closures and switches to shoulders, there may only be six left: the four Martin’s locations in middle Tennessee, and Scott’s-Parker and Ramey’s, in the town of Parsons, in west Tennessee. Pat Martin spent some time working the pits at Henderson’s Thomas & Webb in the early nineties. It gave him a passion for whole hog that accepts no substitution. And his sandwich is, like the excellent ones that we tried at Scott’s-Parker last year, really fantastic. Another change for the better at his restaurant since 2011 is that there are bottles of sauce on the table instead of little cups with your order. Because the juicy meat soaks up the vinegar-pepper sauce so well, I found myself dropping a very small squirt about every other bite of the sandwich, making a great big wonderful sticky-hands mess. Monday afternoons are a lot slower here than Sundays after church. There was only a small assortment of people in the restaurant, slow enough to kick back and enjoy some great barbecue without feeling like we needed to move on and make room. It was a terrific stop, and I loved the sandwich. Looking ahead, I’m adding Ramey’s Whole Hog BBQ to our itinerary the next time that we’re able to go out to Memphis. A little detour to Parsons wouldn’t be too far out of the way. I wish we could justify spending a lot more time and money in west Tennessee. Maybe next year we’ll have a little more cash in the bank and we can just get off I-40 for a full day, finding fun art installations and dairy bars and some barbecue places that are off the beaten path and doing things a very old-fashioned way. Along with at least one of those other places in Brownsville, of course. We do have an obligation, I think. Posted on March 28, 2018 March 28, 2018 by Grant G.Posted in barbecue, nashville, tennesseeTagged barbecue, nashville, nolensville, tennessee. Glad to see you back writing regular posts again. I think I may be visiting Nashville to see Speedy this summer so will need to check out one of the Martins locations. These days, some of my favorite things at Martin’s tend to be the “non-barbecue” items – specifically, the bologna sandwich, the brisket burger, and the white sauce wings. You can’t go wrong with a Redneck Taco though (I think the key is the made-to-order hoecake). I will say, though, that I’ve found less overall quality and consistency at the giant new downtown Martin’s. I tend to stick to the other locations. Since reading Daniel Vaughn’s article, I have been dying to go to Ramey’s. In fact, I tried to go a few weeks ago and found it mysteriously closed on a Saturday. I later learned they’d had a fire the night before. They say they will reopen, and I am currently stalking their Facebook page to find out when that will be. Thank you very much! I hope that we’ll have a few more stories to share before too much longer.